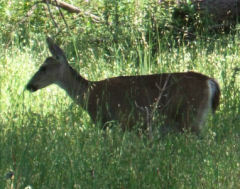 After the hills of the previous few days I decided that something flatter was called for. 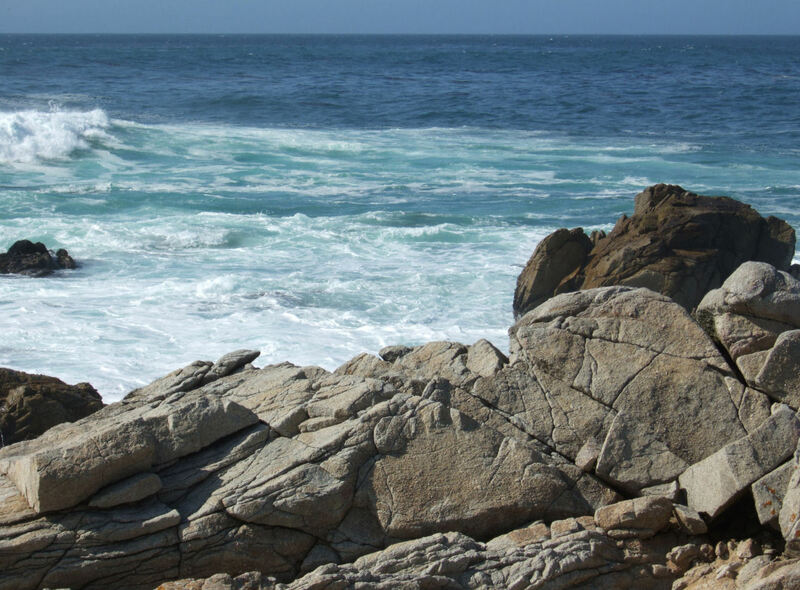 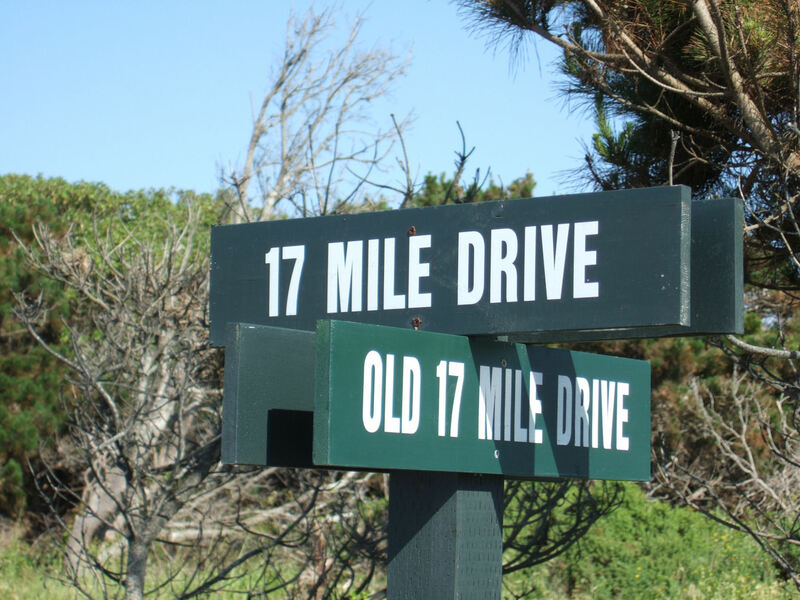 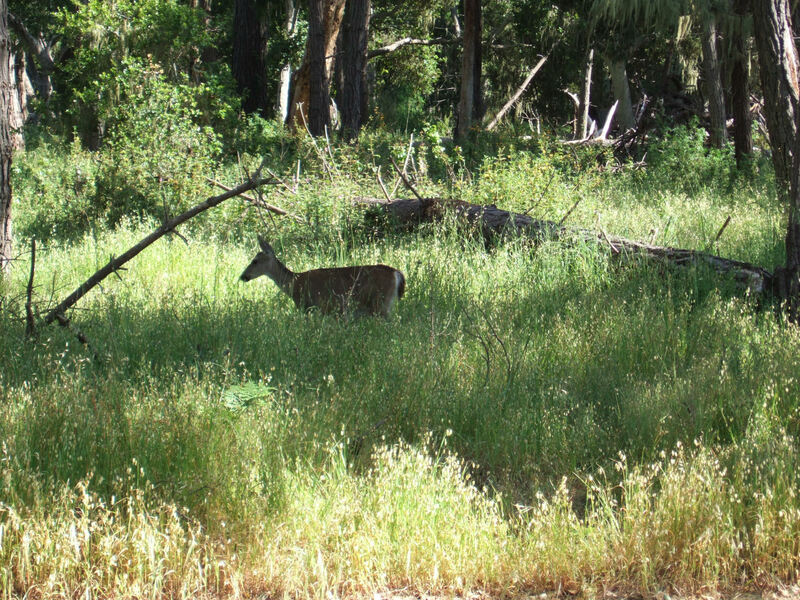 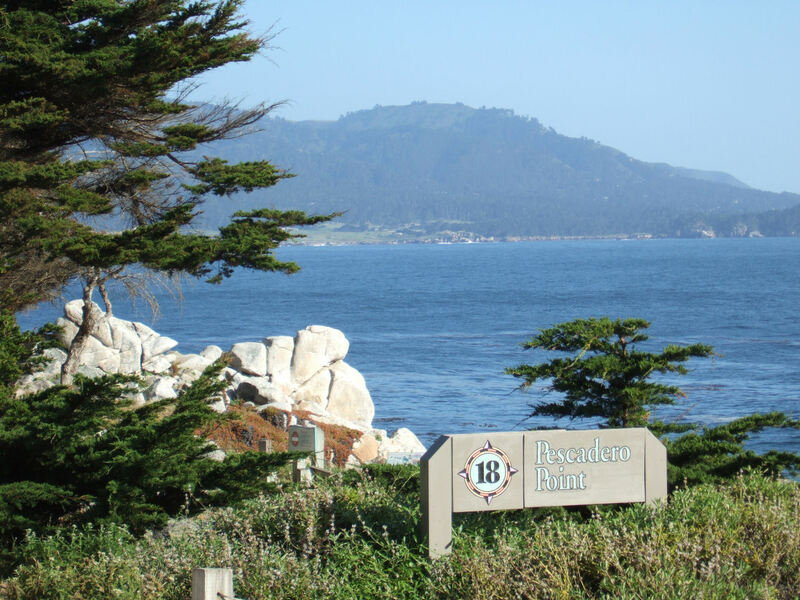 17-Mile Drive which runs right around the Monterey Peninsula seemed to fit the bill. 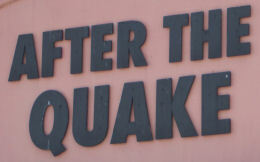 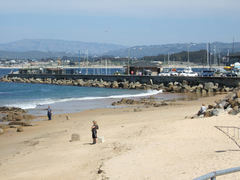 I started my trip in the centre of Monterey ... which is only a few hundred metres from the ocean edge. 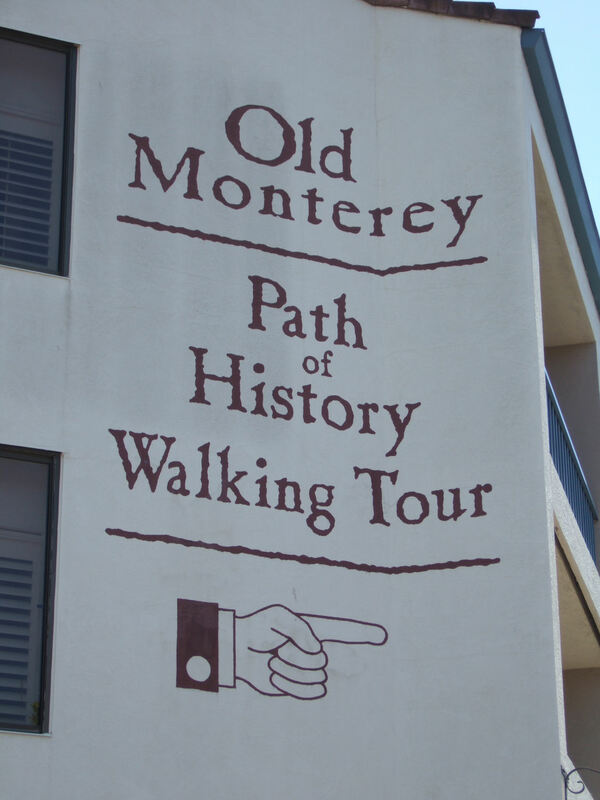 Monterey Bay was first seen (by European eyes) in about 1542 by Juan Rodriguez Cabrillo ... whose path I had last crossed in San Diego. 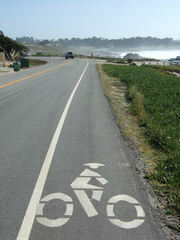 A shared use pedestrian / cycle path runs all along the water's edge. 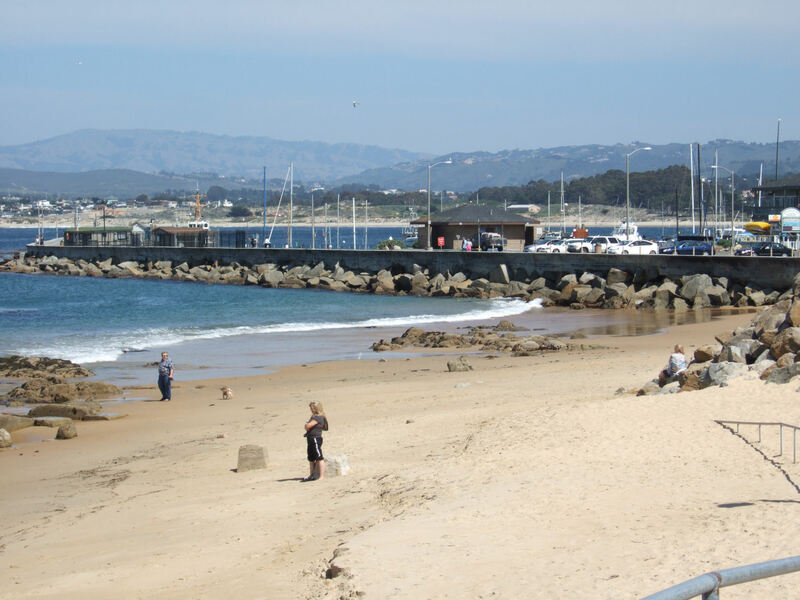 You first pass the touristy Fisherman's Wharf and then a series of small coves which are full of sea-lions basking in the sun. 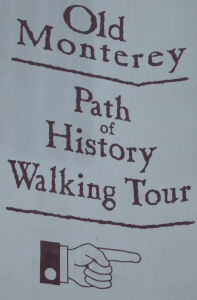 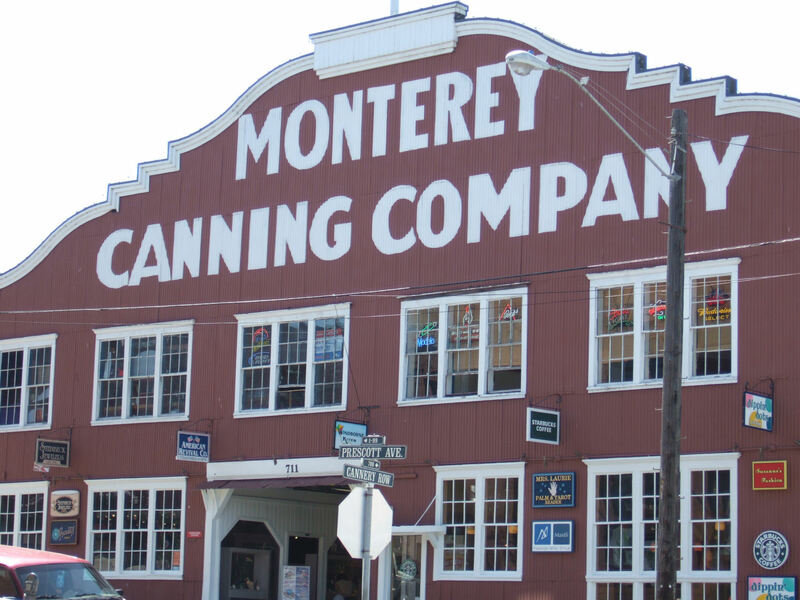 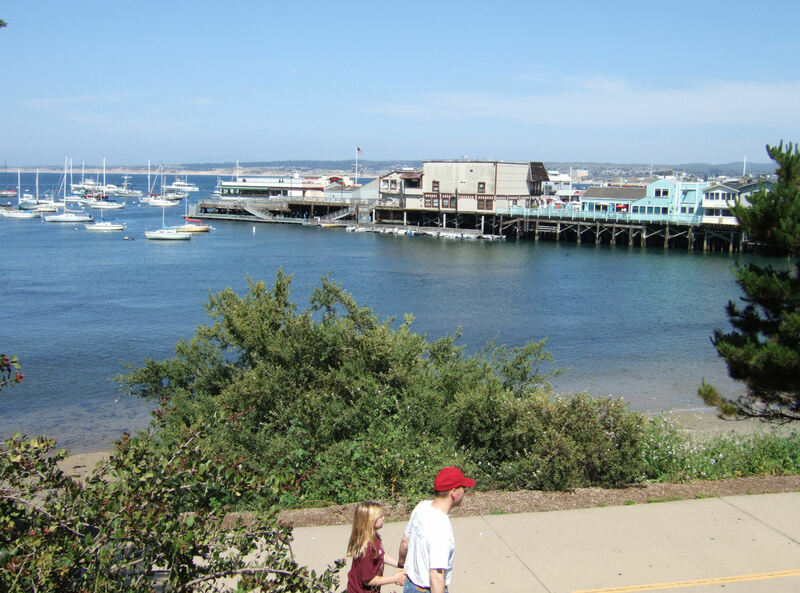 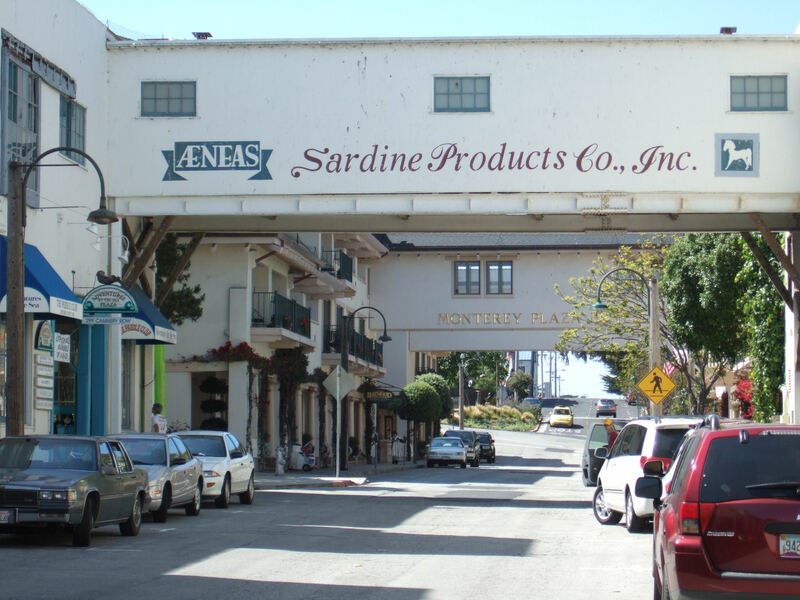 The trail then passes along Cannery Row which was where sardines were canned on an industrial scale. 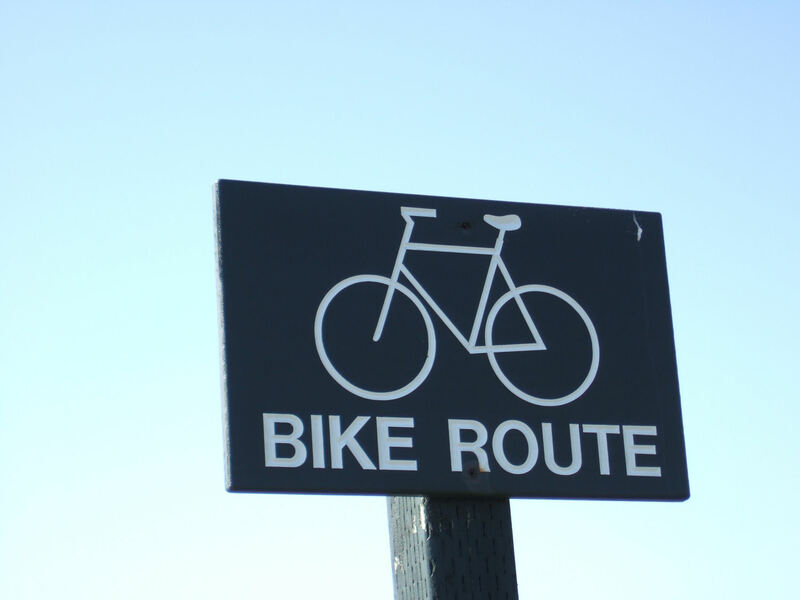 The Row is now a tourist attraction housing shops, restaurants, bars ... and two cycle shops which will also rent you a bike. 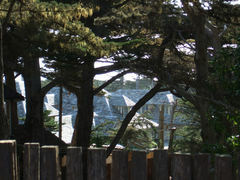 At the western end of the Row stands Monterey's Aquarium. 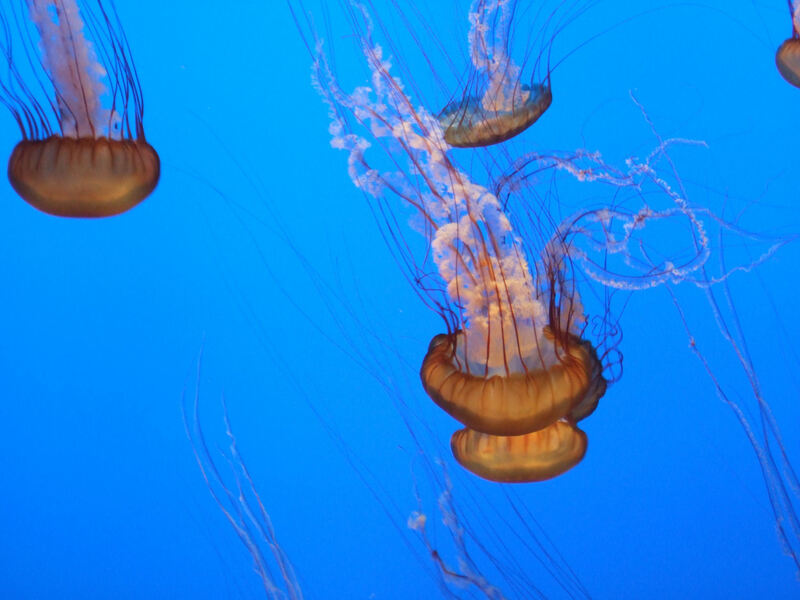 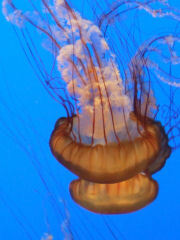 This modern Aquarium houses some stunning displays of our fishy friends. Beyond the Aquarium you join Ocean View Boulevard ... which as its name suggests runs right along side the Pacific. I passed Stanford University's Hopkins Marine Station on Point Cabrillo ... which looks like an idillic spot to do your PhD. 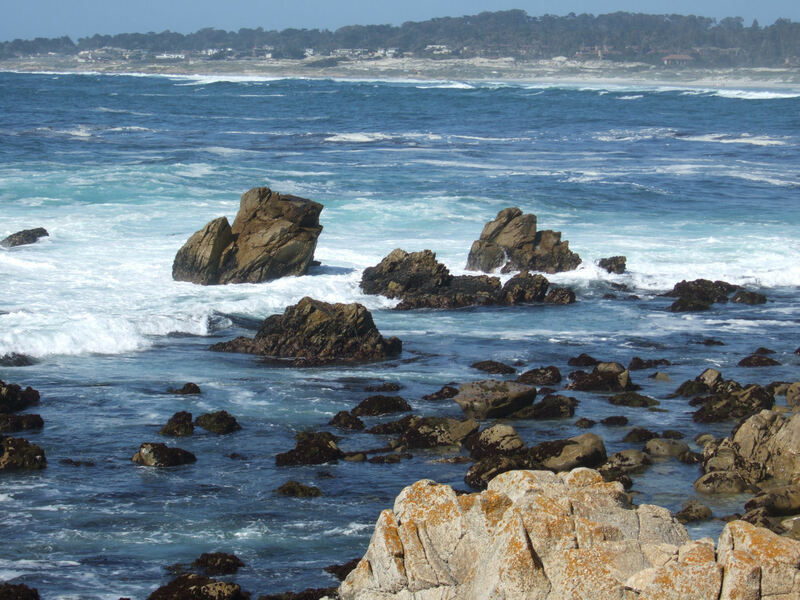 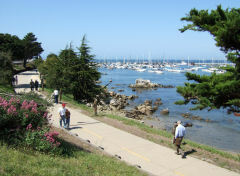 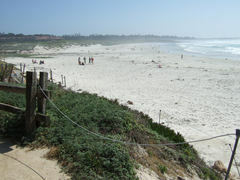 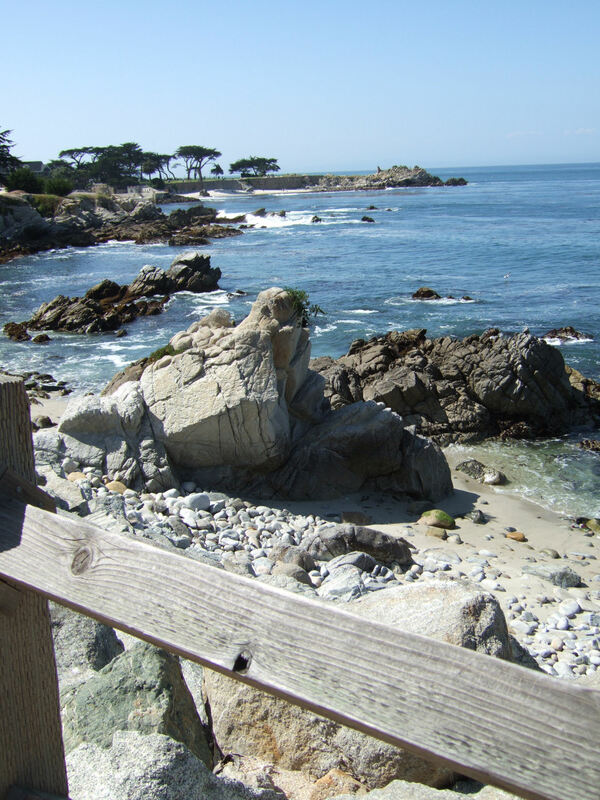 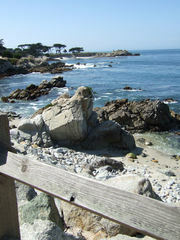 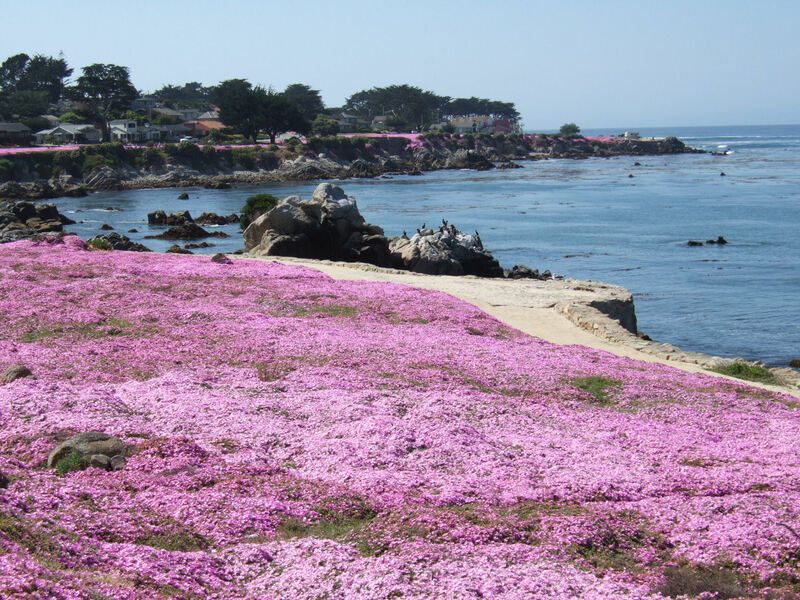 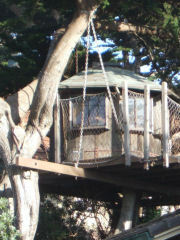 The coastal fringe is part of Pacific Grove Marine Gardens Park. 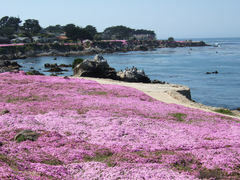 Much of the foreshore is covered with pinky purple flowers. 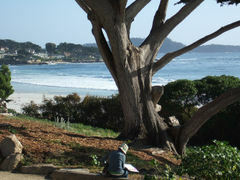 I rode on out to Point Piños were the trail turns southward. 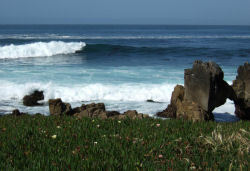 Along this section the waves steadily become bigger as the shelter of the Bay is left behind. The rocky shoreline gives way to sand and dunes ... much of which was finding its way onto the road. 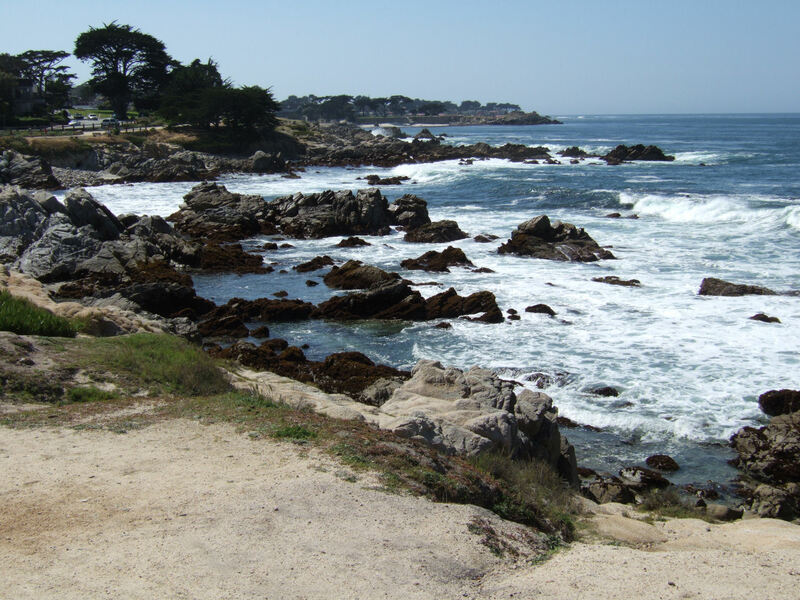 This area is part of Pacific Grove ... and is well known to naturalists as the favoured over-wintering spot for monarch butterflies. 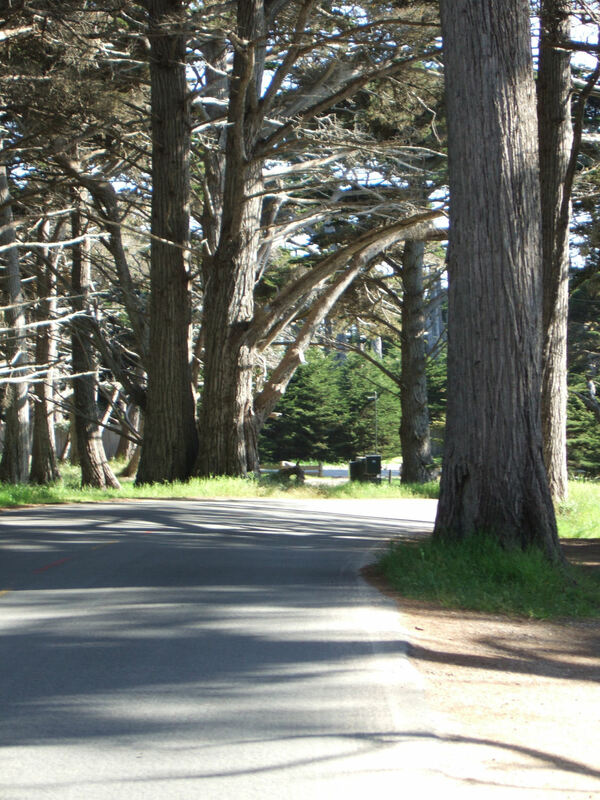 It was the wrong time of year to see monarchs ... but in the shady spots deer could be spotted ... largely undisturbed by cars and cyclists. 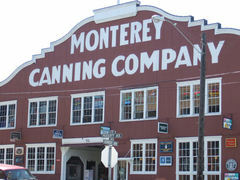 I then stopped at a local market for refreshment. 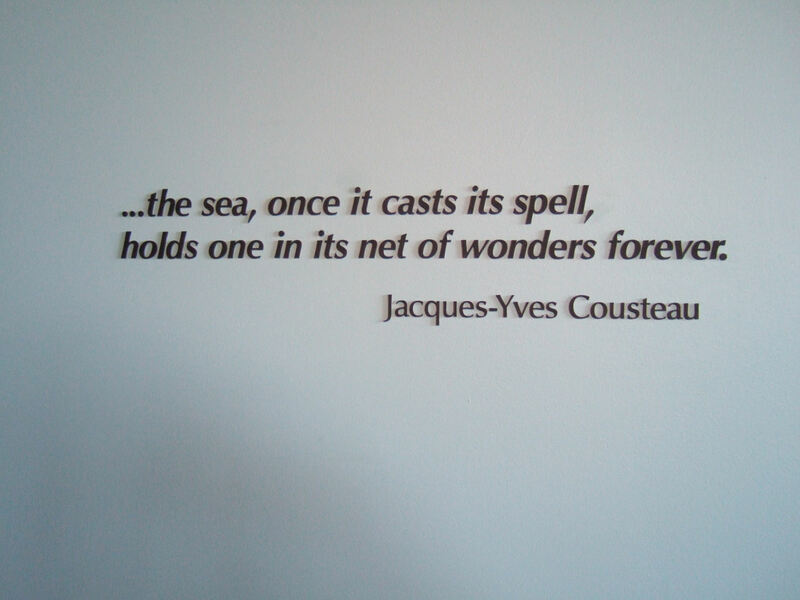 My #1 Rule ... don't fail to stop at any café or store for a drink ... it may be your last opportunity for miles. 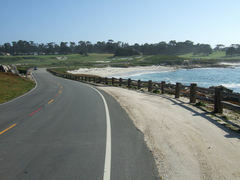 The road then passes through the Pacific Road Gate and enters the start of 17-Mile Drive proper. 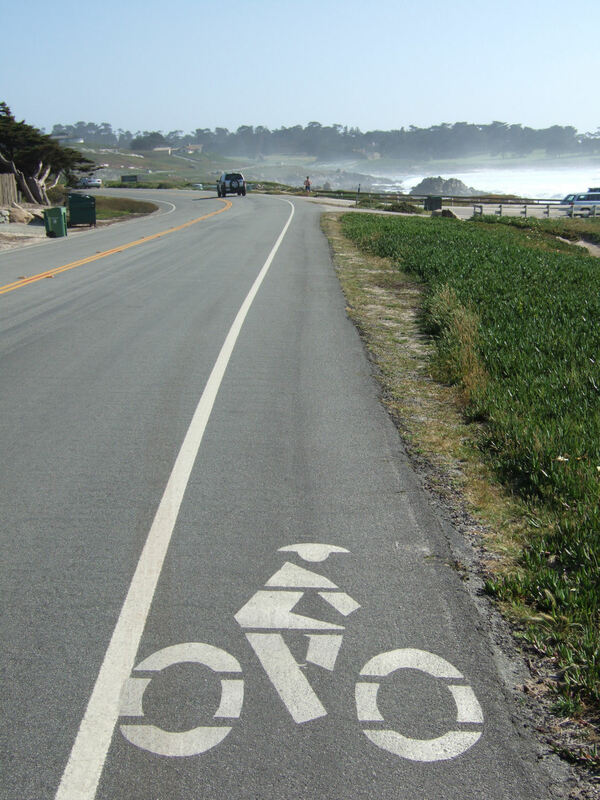 Car drivers have to pay for the privilege ... but cyclists are free and can smugly overtake the line of cars at the pay booth. The road then sweeps around Spanish Bay, through woods, past the junction with Old 17-Mile Drive and on out to Point Joe. 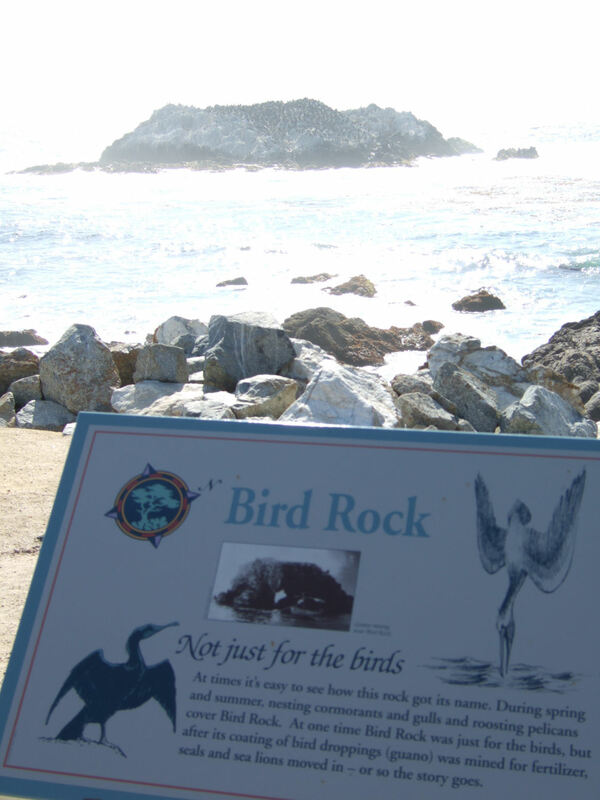 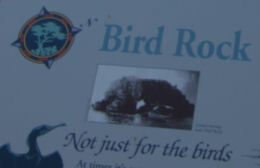 Next stop after Point Joe is Bird Rock. 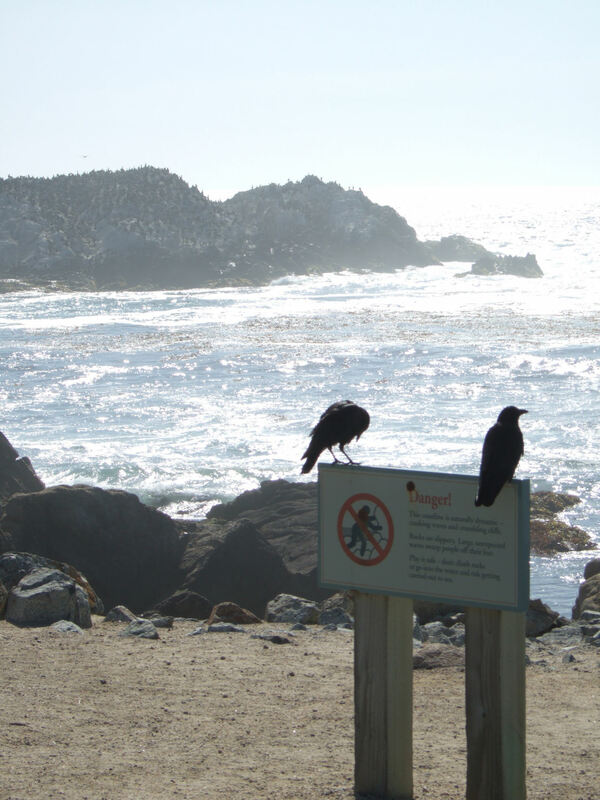 This lives up to its name supporting thousands of cormorants. 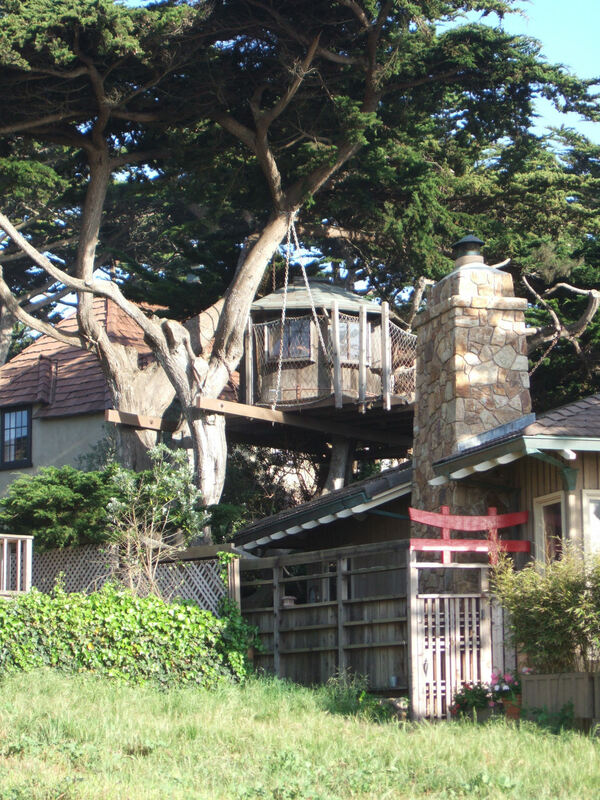 Along this section there are some seriously smart houses. 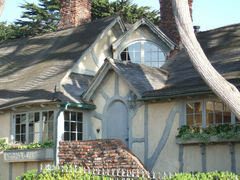 Older houses were being bought up, demolished and replaced by more modern designs. 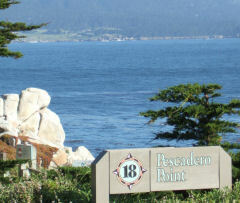 After Bird Point comes Seal Point. 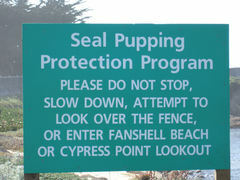 Yes you've guessed it ... home to lots of seals. 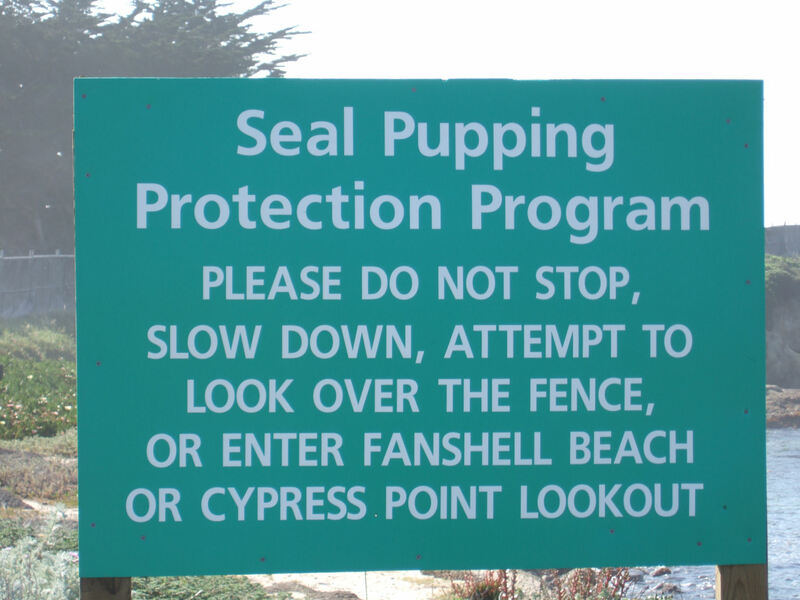 A short section of the foreshore was cordoned off by a six foot high fence intended to give the seals some privacy whilst pupping. 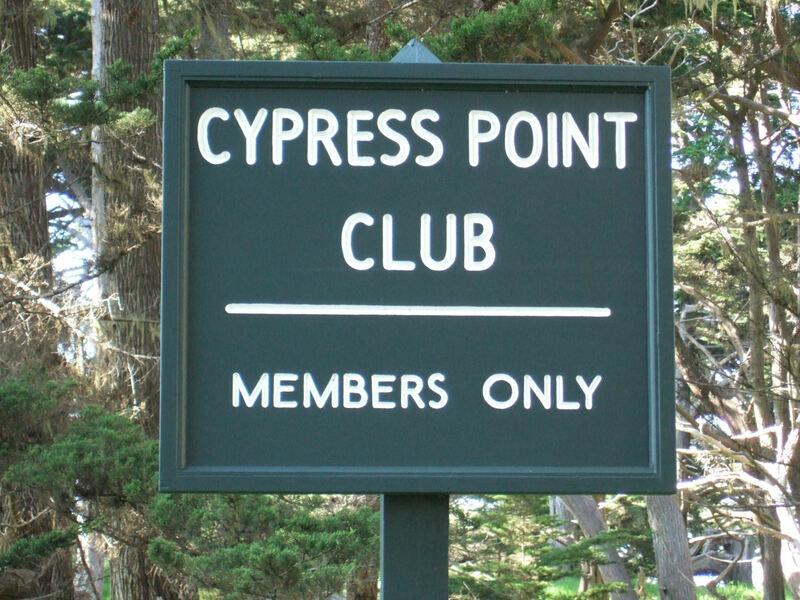 I passed the first of numerous golf clubs ... Monterey Peninsula Country Club, Spyglass Hill Golf Course, Cypress Point Golf Course. 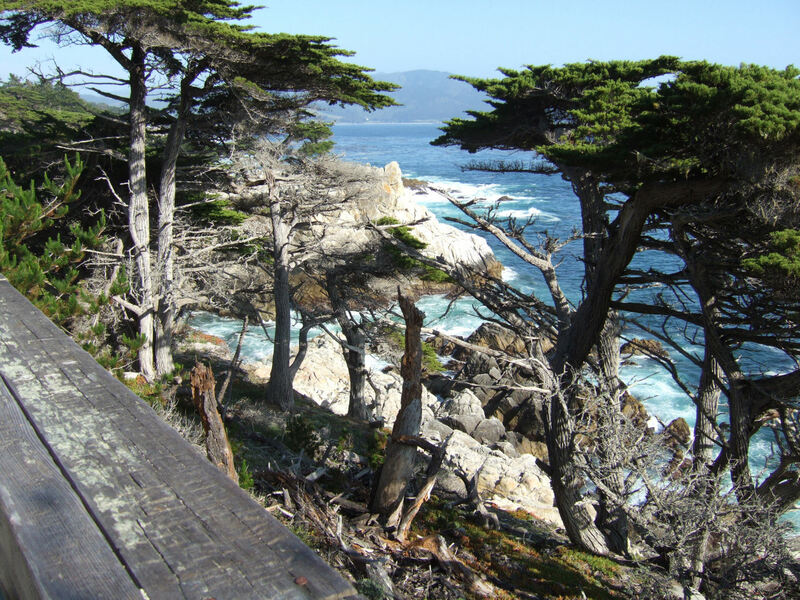 The trail then climbs away from the shoreline into a thick grove of Cypresses. Hidden among the trees are expensive mansions surrounded by manicured gardens. The trail, still buried in the trees, skirts around Cypress Point and then turns south eastward. 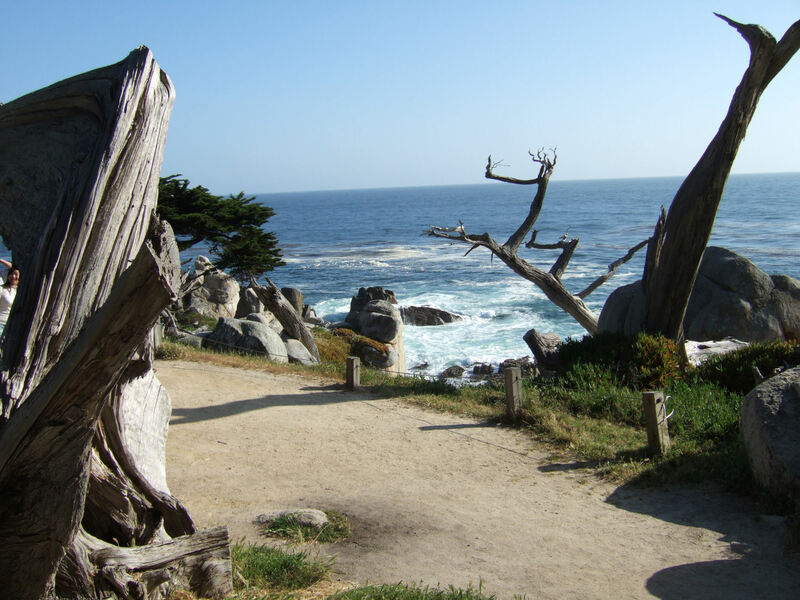 This grove contains the largest and oldest Monterey Cypresses in the world. 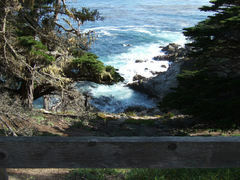 The twists and turns of the road yield occasional glimpses of the sea down below. 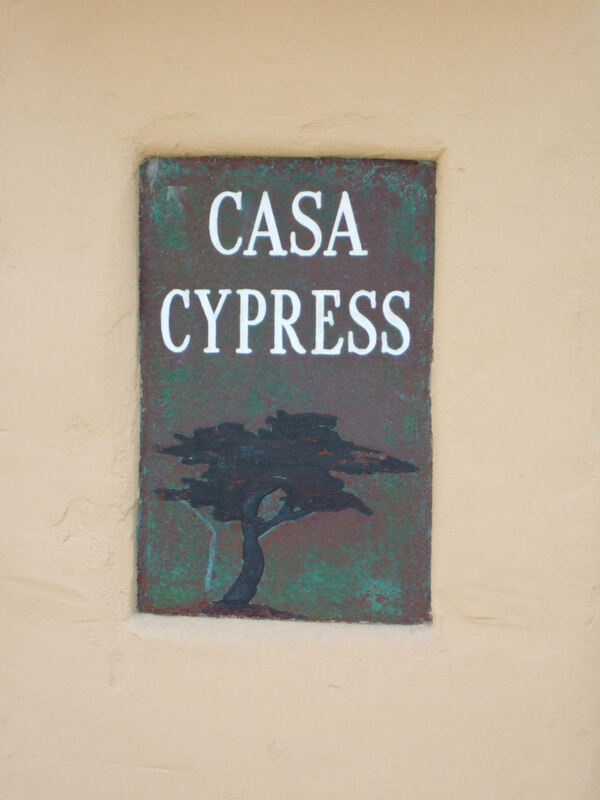 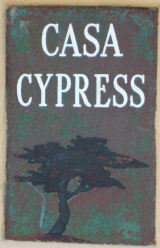 A further kilometre on I arrived at the Lone Cypress®. 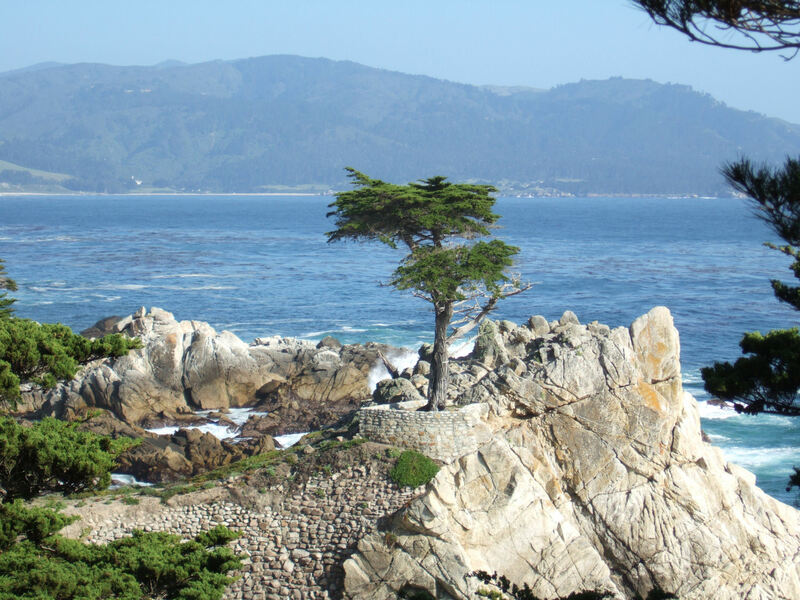 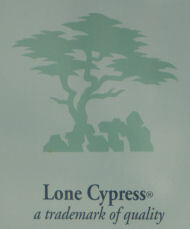 'Lone Cypress is the corporate logo and trademark of Pebble Beach Company'. 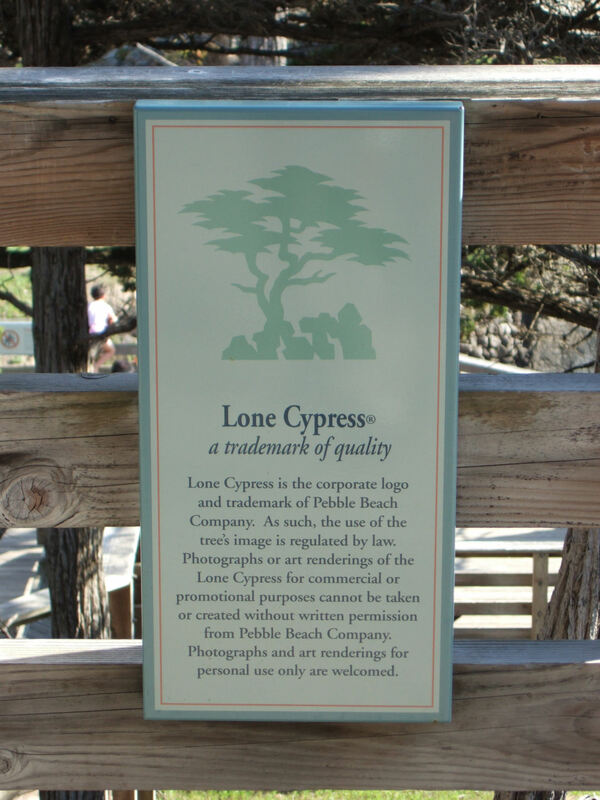 'As such, the use of the tree's image is regulated by law. ... Photographs ... for personal use only are welcomed'. 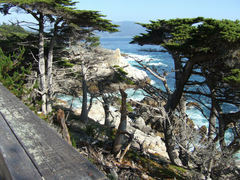 The small parking lot by the Lone Cypress was swarming with visitors. 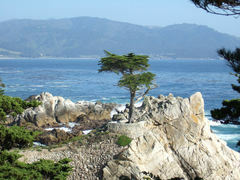 I hope the emissions from all their cars doesn't harm this isolated tree. 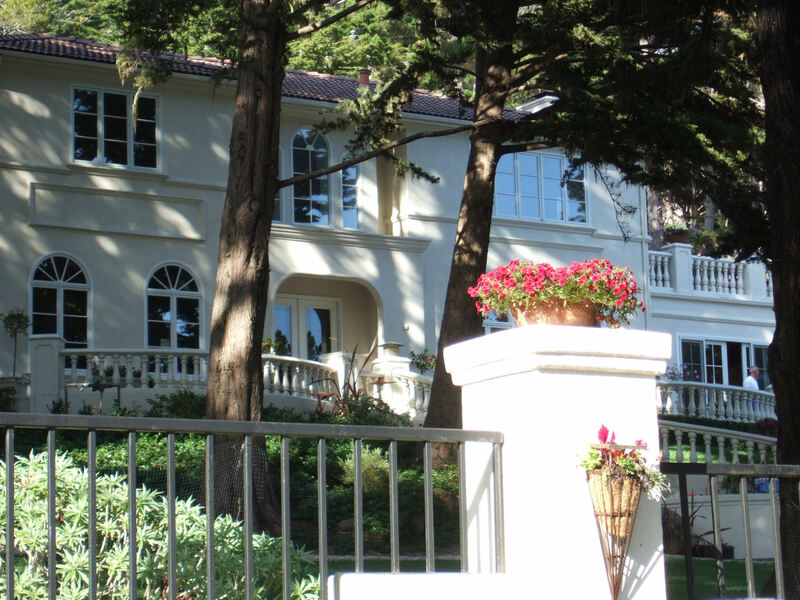 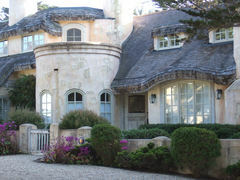 The mansions along this section of the road are even more expensive and elaborate than the ones further north. 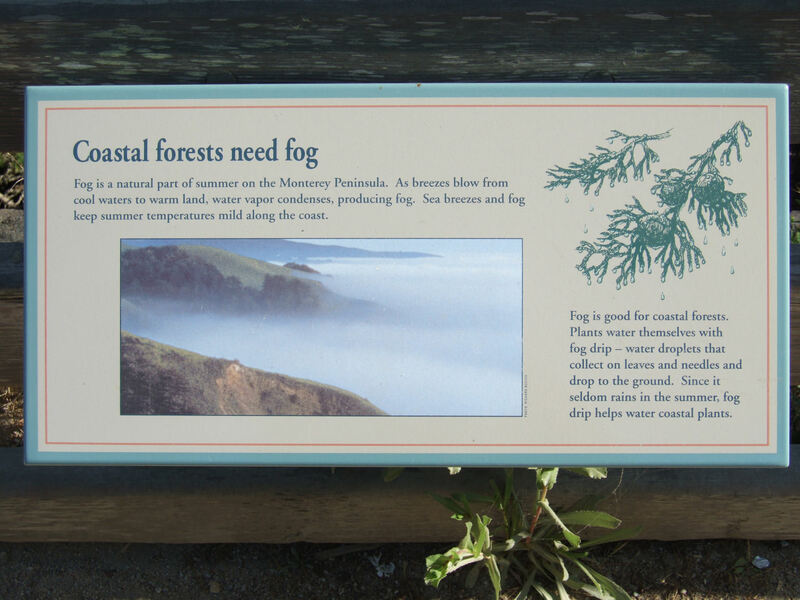 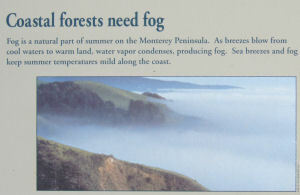 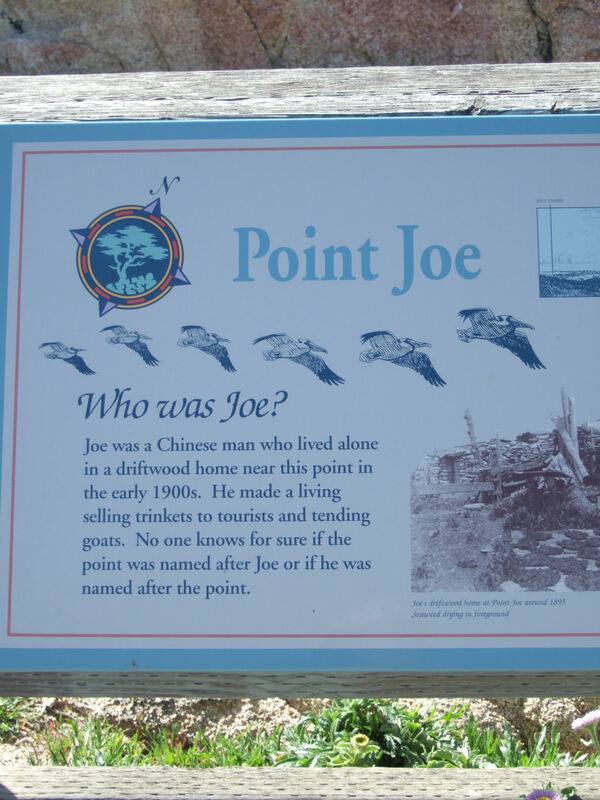 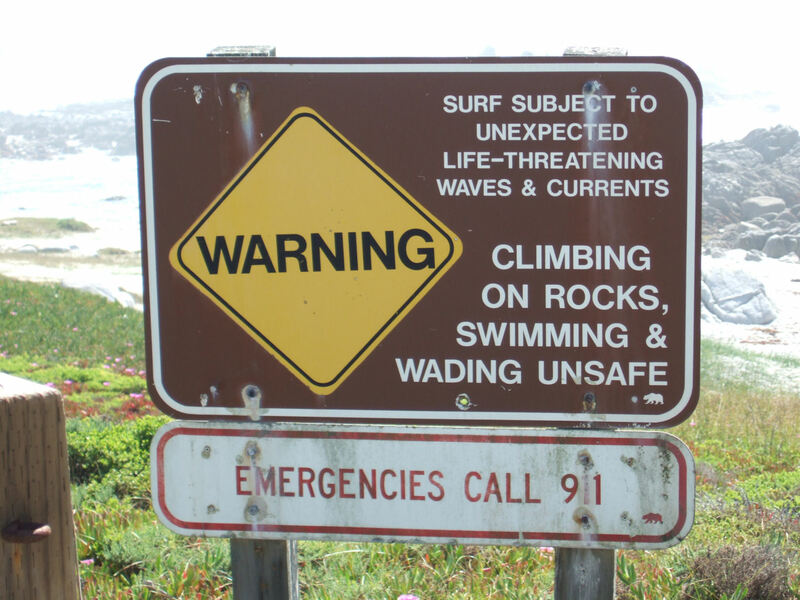 I next arrived at Pescadero Point at the southern point of the peninsula. This offers views southward to Carmel ... where I was headed next ... and on round to Point Lobos at the northern end of Big Sur. 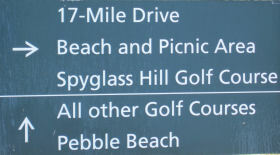 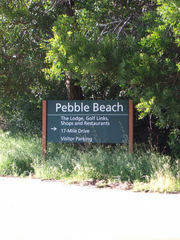 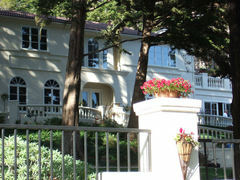 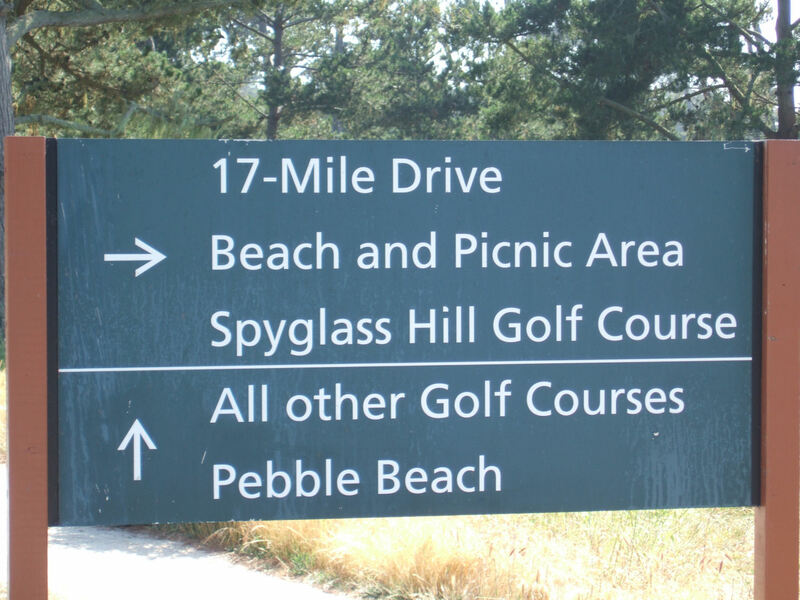 I arrived next at the posh resort of Pebble Beach ... famous for its golf course. 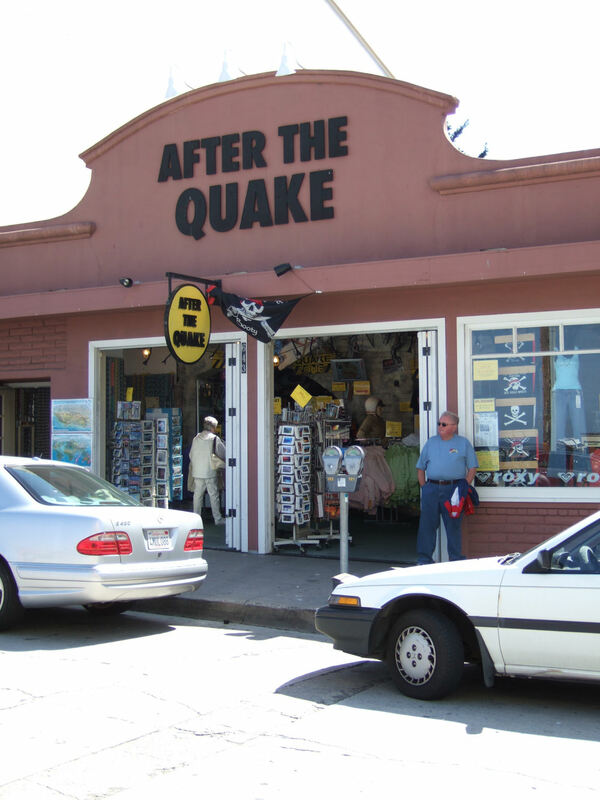 As I cycled through one of the staff in black tie said 'Good Afternoon Sir' ... 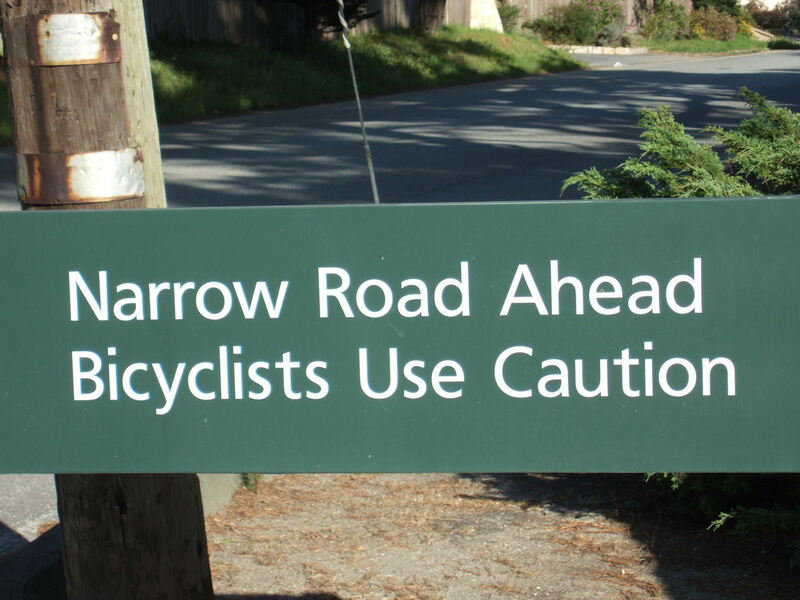 I don't think that this has every happened to me on a bike before. 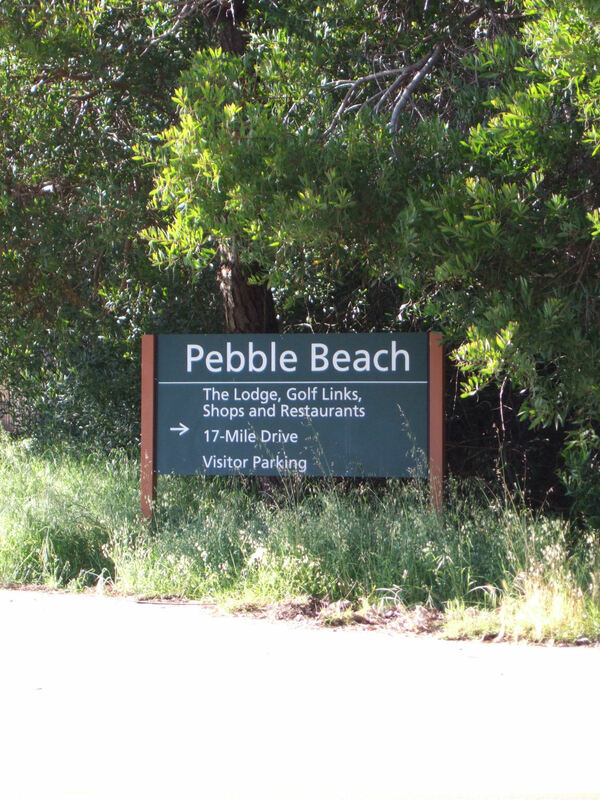 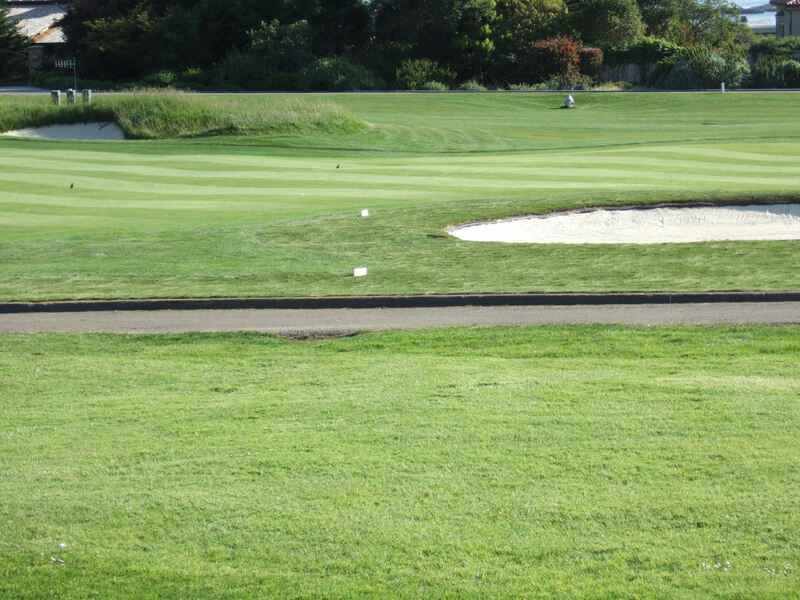 There is currently a proposal cut down around 17,000 trees in the rare coastal forestland at Pebble Beach in order to construct a new golf course and to expand two luxury resorts. 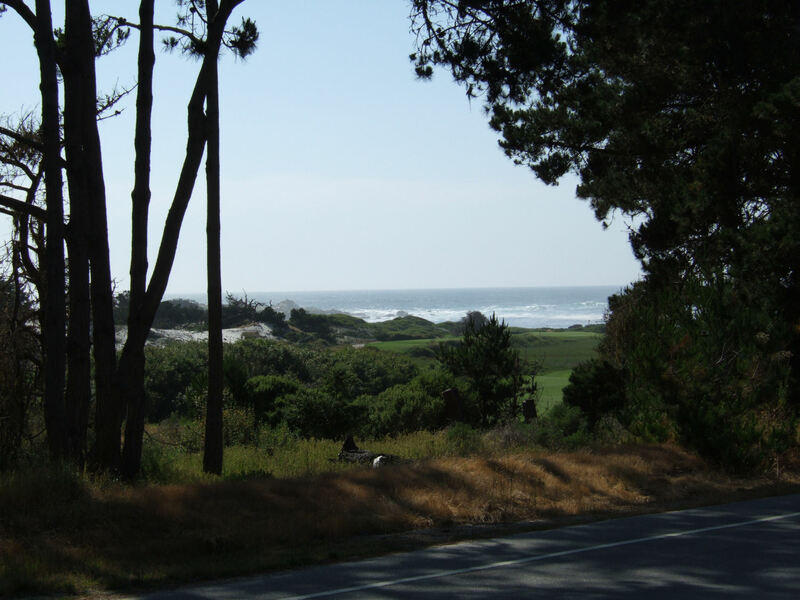 The California Coastal Commission is against the plan which is backed by high profile celebrities such as Clint Eastwood and Arnold Palmer. 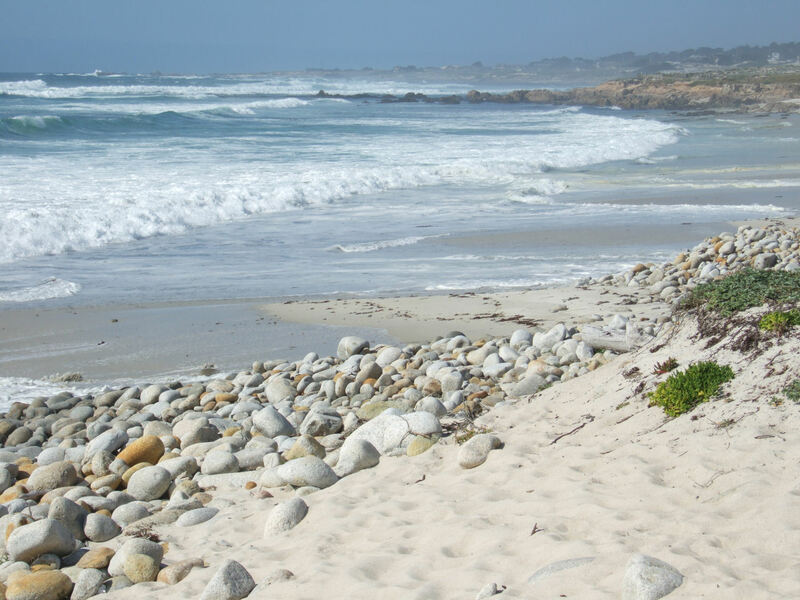 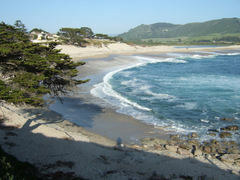 After Carmel Gate I left 17-Mile Drive and dropped down to the sandy foreshore in Carmel. 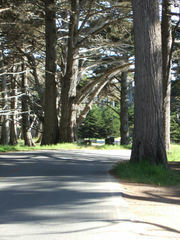 A quiet shaded road runs right along the beach edge. 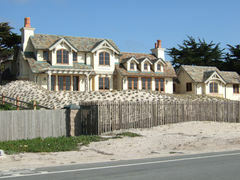 Small houses are tucked close together along the roadside. Their design seems to be influenced more by Hans Christian Anderson and Walt Disney than Frank Lloyd Wright. 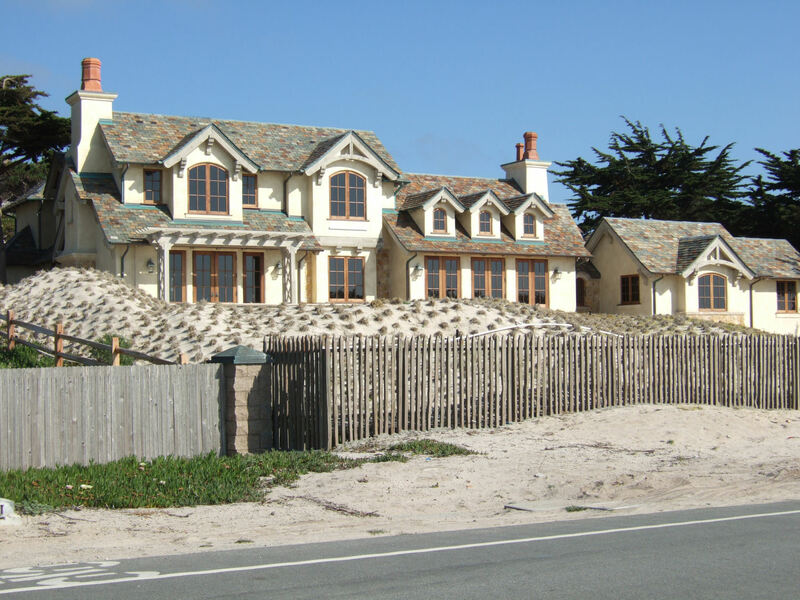 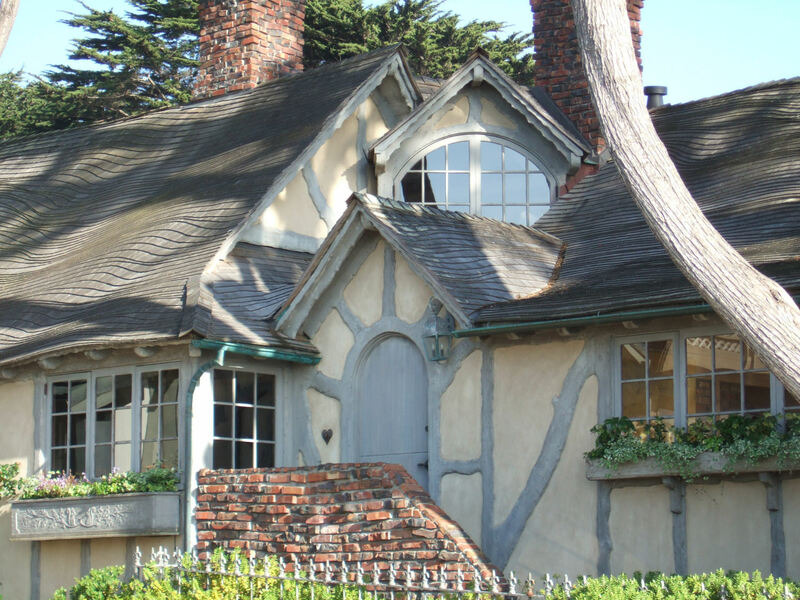 The current fashion seems to be for wavy roofs ... which make many of the homes look as if they've been made of gingerbread. At the southern end of the bay I rounded Carmel Point which opened up views over the steeply shelving Carmel River State Beach. 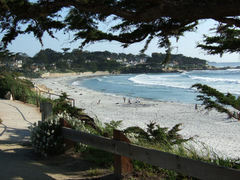 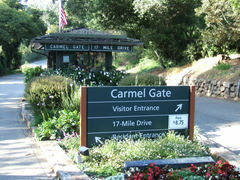 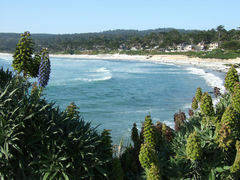 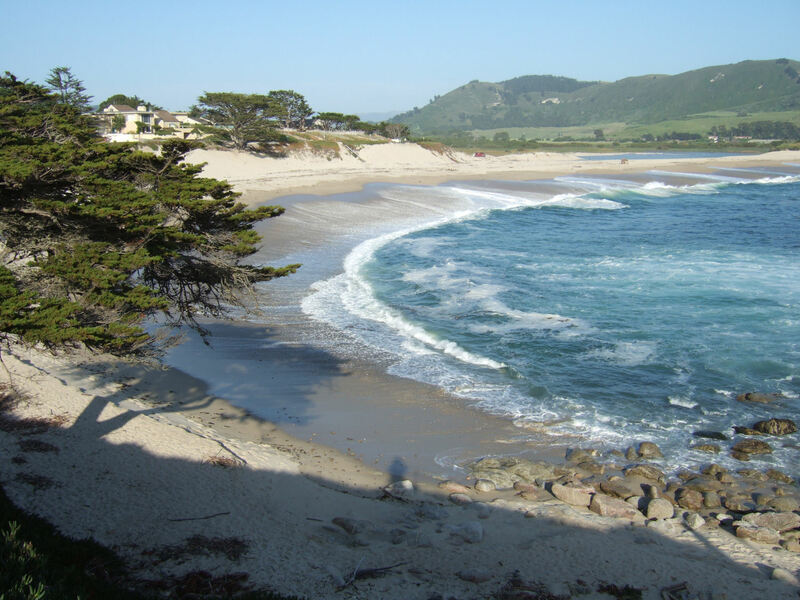 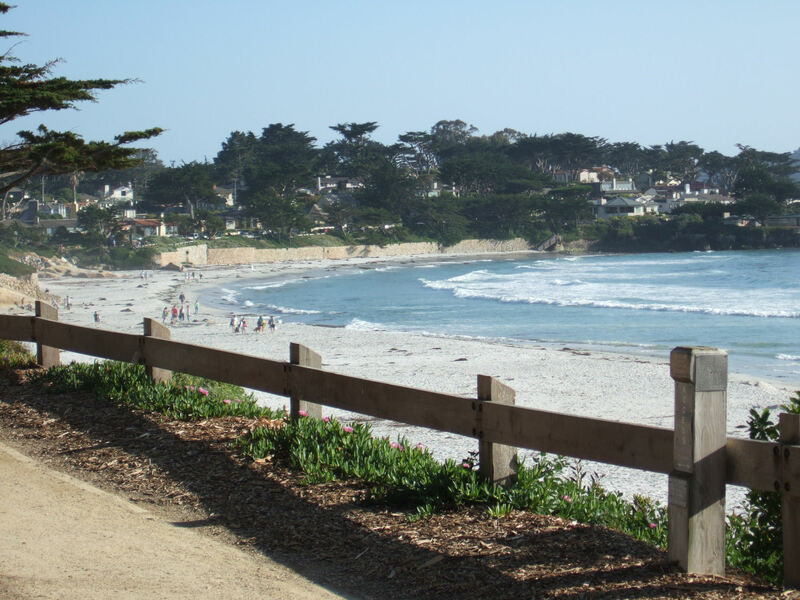 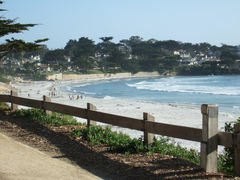 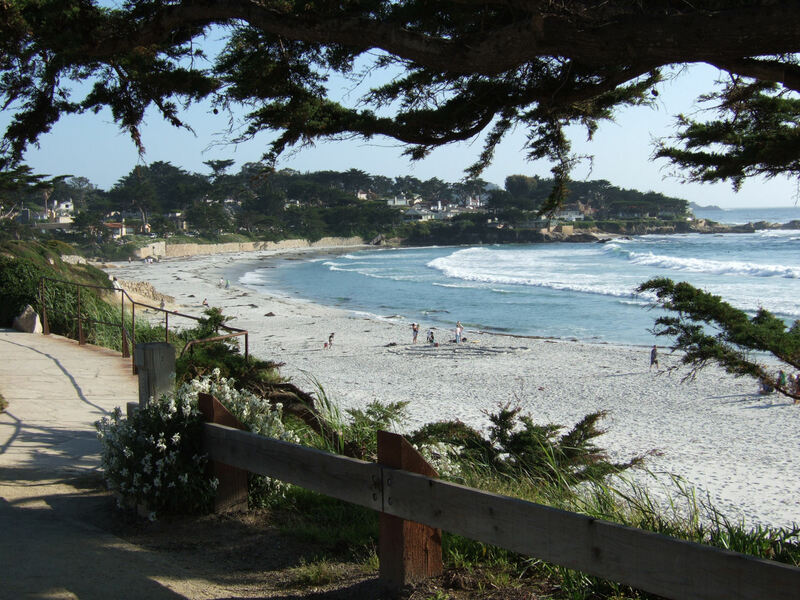 After a stop for refreshments I headed back through the town of Carmel towards Monterey to complete my loop. 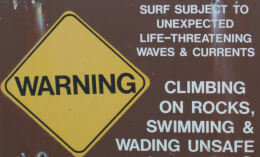 This gave me a slight shock as I had to climb to a height of 150 metres. 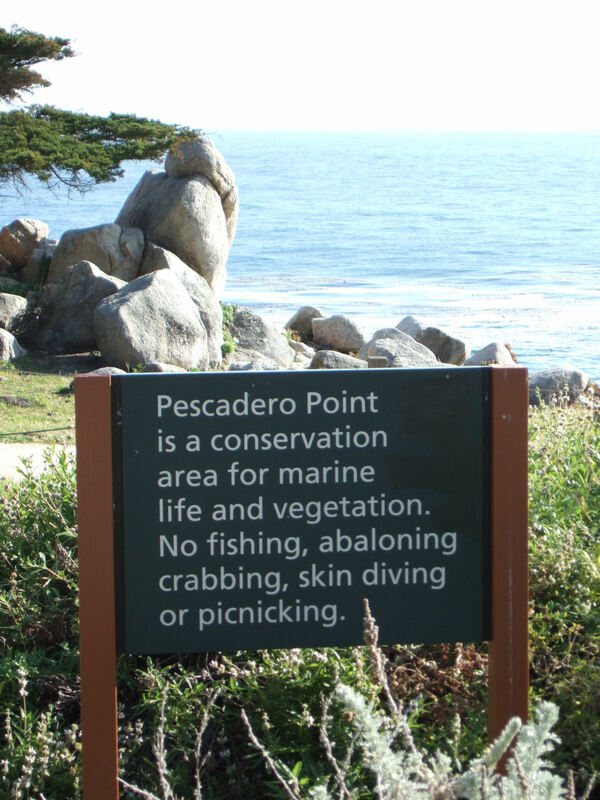 Maybe next time I'll retrace my route back along the coast.